Celtic manager Ronny Deila bemoaned a lack of concentration from defender Efe Ambrose following the 2-2 Europa League draw with Fenerbahce. Ambrose was at fault for the first of Fernandao's two goals, the brace bringing the Turkish side level in Glasgow. Deila's side now have two points from two games in Group A. "If you see the overall performance, when you are defending you need to keep concentration for 90 minutes," he said. "That's the biggest challenge Efe has. He plays in 88 minutes very good but he has, sometimes, some easy mistakes and today was one of them. "We played well in the first half. We get 2-0 up and it was important to keep that lead into the break and I thought we would have a very good chance in the second half. "Then we conceded an easy goal. Of course, that gave them energy and put us a little bit on the back foot. "They didn't create a lot, they created some crosses and they get a goal from the set play. Again, that's of course disappointing that they score on almost the two chances that they had. "I'm a wee bit disappointed that we didn't win, but I'm happy that we get the point and the group is still very open. "It's a very good result. The group is in our hands still. We can do it so there's a lot of possibilities." 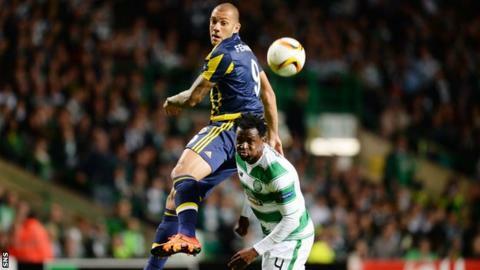 Ajax and Celtic both have two points - one more than Fenerbahce - and Molde have four. The Norwegian side host Celtic on 22 October and then visit Glasgow on 5 November. Deila was asked about Celtic's tendency this season to lose leads in European matches, having been pegged back twice against Ajax two weeks ago. Their goals against Fenerbahce came from Leigh Griffiths and Kris Commons strikes. "It's always a concern, but it's better to do that than go under and then stay under so you can see it in different ways," the Norwegian replied. "What you can see is that when we believe in ourselves, on the ball when we dare to play football then we are a good team. That's what we need to do more. We have to really go for it and play our system, believe in ourselves on the ball and defend as high up the pitch as possible. Sometimes you have to get deeper. "I want to see us more on the ball, I want to see us braver on the ball, to develop our own play and that's going to be the key for the future. "I'm very happy with Kieran Tierney today. He did a very good [European] debut. Scott Brown was fantastic in the midfield, worked really hard and kept the team together. James Forrest with that work-rate, what a difference we can see in him compared to half-a-year ago."